While the role of the CIO remains relevant, partners must be conscious of the rising importance of line of business leaders when purchasing it. Sitting downstairs in the air- conditioned reception area, with sweaty palms and a sizeable slide deck, partners across Australia continually put themselves on the line. Armed with technical knowledge and a never ending brochure of products, access to the boardroom has traditionally been viewed as both crucial and coveted. Because inside offers the keys to the IT safe, held by the decision- maker with the potential to prolong or pause a reseller project. Yet in 2017, the channel battleground is seldom fought in the stuffy and suited office of the CIO, nor at a tedious table crammed with executives. Now it’s more likely to be a soy cappuccino in Surry Hills, a quick bite in St Kilda or a frosty beer in Fortitude Valley. Perhaps a little exaggerated and perhaps a little stereotypical, but for the channel, a key trend is emerging in Australia. Non-IT business people have become empowered to make IT purchasing decisions more than ever before, with the centre of gravity shifting across the C-suite. Spanning sales and marketing, human resources (HR), finance, digital, security and much more, line of business (LOB) leaders are fast becoming legitimate technology buyers. While the CIO remains a relevant and crucial cog in the buying wheel, the channel must now be conscious of the new breed of IT buyers across Australia, those without a technology diploma, and those unmoved by speeds and feeds. Who are the new buyers of IT? What are they buying? What matters most to these buyers at various stages in the buying journey? What should tech providers do to help them buy technology? As technology has been integrated across the enterprise to transform work processes, LOB leaders now have devoted resources to collaborate with IT, together leveraging joint expertise to identify and select technology solutions. Based on IDG research, approximately 40 per cent of tech-involved LOB leaders across the globe are engaged in helping determine technology requirements for their organisations, and do so jointly with traditional IT leaders. Of importance to resellers, tech-involved LOB leaders also recommend or select vendors and develop business cases for financial investment. In fact, among tech-involved LOBs visiting IDG’s hundreds of B2B websites — spanning ARN sister publications such as CIO, Computerworld, CSO and CMO — 68 per cent have “personal responsibility” for vetting solutions and vendors for two or more technology areas. Painting a telling picture for the Australian channel as a result, the research - which includes both global and local leaders - suggests that 38 per cent of LOB personnel “directly influence” annual IT budgets, with 32 per cent holding an “indirect influence”. 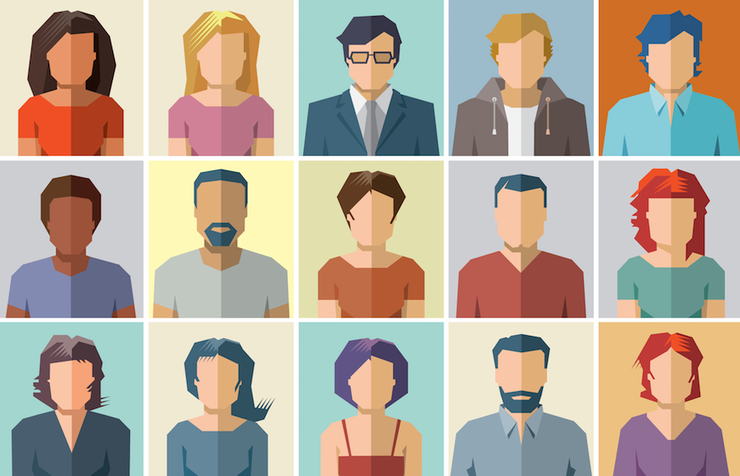 Collectively, 70 per cent of non-IT managers are impacting how technology dollars are spent, illustrating the changing face of the buyer for resellers. Considering themselves as customer-centric change-agents, LOB influence extends throughout the IT purchase process, with 65 per cent determining the business need, 60 per cent evaluating products and services, and 59 per cent authorising and approving purchases of products and services. Typically, they are open to new technologies and exploring new frontiers, with 57 per cent now recommending or selecting vendors for purchase, with 51 per cent determining technical requirements. But despite the direction of travel becoming clearer for the channel, many partners will attest that CIOs still call the shots in technology purchasing decisions, and that the IT department remains in control over how and where money is spent. No doubt this will remain true for many organisations across the country, but this research — coupled with a myriad of end-user examples across Australia — points to purchasing decisions increasingly coming outside of IT, a pattern partners must not only acknowledge, but crucially, act upon. The end result is widespread involvement from LOB leaders, with 88 per cent influencing the buying of software, including applications and software infrastructure. Furthermore, 72 per cent are now being consulted on hardware (servers, storage and devices) investments, 62 per cent on cloud services (SaaS, PaaS, IaaS), 57 per cent on IT services (support services, operations management) and 51 per cent on network technology (cables, hubs, routers). 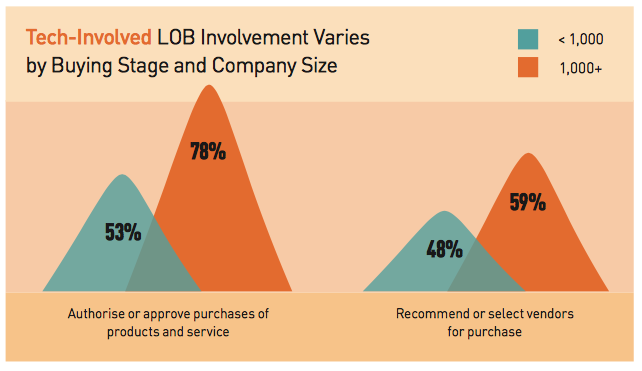 Naturally, LOB involvement varies by buying stage and company size, with 53 per cent authorising and approving purchases of products and services in organisations of 1,000 seats or less, compared to 78 per cent in over 1,000 seats. In addition, IDG research shows that smaller organisations are 59 per cent more likely to have LOB leaders recommend or select vendors for purchase, compared to larger businesses at 48 per cent. Echoing IDG research findings, IDC predicts that the share of worldwide corporate IT spending that is funded by non-IT business units will reach 47 per cent in 2019, an increase of more than three per cent over 2015. “3rd Platform technologies such as cloud, mobility, big data, and social business have created the underpinnings for business process transformation and, in some cases, business model transformation,” IDC program director of customer insights and analysis, Eileen Smith, said. IDC’s LOB taxonomy identifies two major types of technology spending — projects funded by IT and projects funded by technology buyers outside of IT. Specifically, joint IT projects can be funded by either IT or the functional business unit while Shadow IT projects are funded from the functional area budget without the knowledge, involvement or support of the IT department. From a functional perspective, IDC’s technology buyer research focuses on twelve purchasing segments. Industry-specific operations, which includes unique industry- specific functions that are required for running day-to-day operations (i.e., manufacturing plant floor, claims processing, etc.) is the largest segment of LOB spending (US$252.7 billion worldwide in 2015) but the smallest segment in terms of LOB spending share (45.5 per cent). The two segments with the largest LOB share of IT spending — supply chain management (54.4 per cent in 2015) and customer service (53.9 per cent) — are also the second and third largest segments in terms of spending size. Much like regional trends — and in keeping with IDG findings — IDC expects all twelve functional purchasing segments to increase their share of IT spending within the next three years. The fastest growing functional areas are marketing, with a 6.4 per cent compound annual growth rate (CAGR), followed by security and risk (6.0 per cent), and customer service (4.8 per cent). Such extended influence across the organisation comes at a time when total IT spending in Australia is forecast to reach almost $85 billion in 2017. Representing a 2.8 per cent increase from 2016, the slight surge comes as organisations build out digital platforms, across every aspect of the business, as LOB leaders press ahead with transformation agendas. Globally, IT spending will be driven by growth in software and IT services revenue and is forecast to reach US$3.5 trillion in 2017, up 2.9 per cent from 2016 estimated spending of US$3.4 trillion, according to Gartner findings. Closer to home, the bright spot for the Asia Pacific region has also been the software and IT services segments, set to grow 10.2 per cent in 2017 to total US$39.3 billion and increasing six per cent to reach US$98.8 billion respectively.